Dubbed Aero-Vederci Baby!, the moniker of Aerosmith’s latest world tour leaves little doubt about the chapter which the legends now enter. 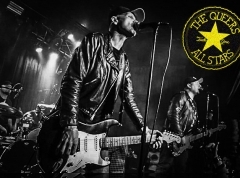 The time has come for another dinosaur to begin its long goodbye and although guitarist Brad Whitford has suggested that the farewell could even last until 2021, we at this webzine were not going to be taking any chances — we had to witness the band bowing out of Denmark one last time. 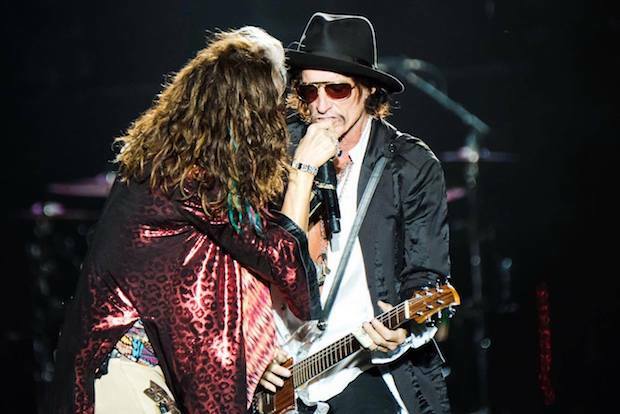 To Copenhagen’s newest venue Royal Arena thus we headed, wondering why the promise of such illustrious rockstars as Aerosmith bringing all of their classics, was not enough to sell all of the 16,000 tickets on offer. “Did I miss out?”, the abstainers can be heard wondering and to that, we say: ”Read On!” (har!) to find out. Having spent the brunt of 2016 warming up for Black Sabbath, Rival Sons are no strangers to entertaining massive audiences. They do, however, frequent Denmark at such a rate that one is forced to wonder if the buzz around the Long Beach, CA-born heritage rockers hasn’t fizzled out by now and entertain a healthy skepticism regarding their ability to still raise an eyebrow. But it turns out that the ‘Sons were born to rock arenas, setting the tone with a bombastic rendition of “Electric Man”, which is delivered with the bravado of superstars. At the centre of it is the ever-charismatic vocalist Jay Buchanan who, with his charm and swagger and soulful singing, is the subject of many an adoring eye, while his cohorts prefer cool composure and playing their instruments with nerve. Mind you, the four musicians — guitarist Scott Holiday, bassist Dave Beste, drummer Mike Miley & keyboardist Todd Ögren-Brooks — don’t mind basking in the limelight either when the moment is right; during the feverish second half of “Secret” and the solo section in “Torture” in particular, it is their symbiosis that is at the forefront, reminding us that Rival Sons is not simply imitating, but in fact epitomising the style of their heroes (your ‘Zeppelins, Deep Purples, Doors et al.). Unlike earlier this year, the ‘Sons don’t seem to take popularity for granted tonight; they actually come across as a band with plenty to prove and as such, the complacent attitude that so bothered me at VEGA never manifests. For instance, Buchanan’s speech about forgiveness — an introduction to the evening’s choice of ballad, “Where I’ve Been” — is laced with genuine emotion and as a consequence, the piece sounds so much more powerful than it tends to, inviting a myriad lighters to be brandished and the words ”She says: ‘how could you love me, when you know where I’ve been?’” to be sung out loud. The track emerges as an unexpected highlight amidst the oomph and energy of Rival Sons playing their A-game and it all makes you wonder: perhaps these Californians are ready to take the leap and start playing arenas on their own? Quite frankly, it is depressing that so many people should only associate Aerosmith with “I Don’t Wanna Miss a Thing” — the smash hit they recorded for Michael Bay’s 1998-blockbuster, “Armageddon” — considering the amount of rock music history the Bad Boys from Boston have written since their formation in 1970. The piece is without a doubt one of the greatest rock’n’roll ballads of all time and deserving of the thunderous roar of 15,000 voices singing its chorus in unison tonight, but honestly, it does not arouse my excitement. Much more so the respective opening tracks of 1985’s “Done with Mirrors” and 1989’s “Pump”, the high voltage of which makes them (“Let the Music Do the Talking” and “Young Lust”) shrewd choices for instilling a celebratory mood among the audience. 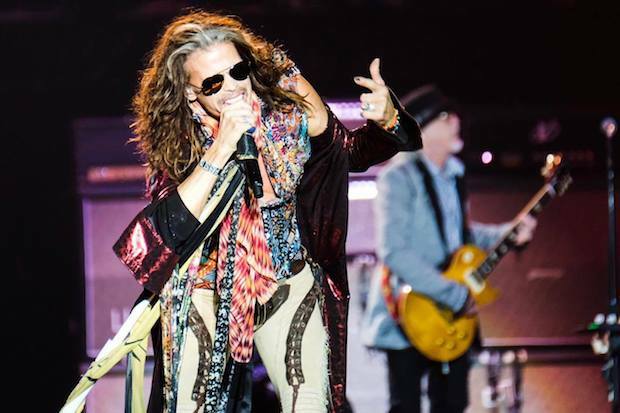 Even if the two songs exceed the depth of an average joe’s dabbling in Aerosmith’s repertoire, it must be impossible to resist their frolicking drive — at the very least, they seem to infect most of the arena with the participatory virus, which fires up the sing-song-synapses just in time for the ‘90s favourite “Cryin’”. During this revered power-ballad, one is stricken by how well Aerosmith, and vocalist Steven Tyler in particular have aged. Nevermind that he is turning 70 years old in March next year and has admitted to shovelling $5 to $6 million worth of powder into his nostrils during the ‘70s and ‘80s, he still has the lungs and vocal chords, and performs with the braggadocio and stamina of a man in his prime. The other musicians — guitarists Joe Perry & Brad Whitford, bassist Tom Hamilton and drummer Joey Kramer — are not far behind, each utilising the full repertoire of classic rock moves, poses and expressions and looking like gents who never doubted that music is their one true passion. Unlike so many other big artists that are often preoccupied with the privileged few within a fenced off ’Golden Circle’, Aerosmith performs as much for the cameras as for those that coughed up the extra 100 DKK to enjoy an ‘exclusive’ area (which, ludicrously, takes up more than half of the floor space and never even fills up…) — a welcome gesture, and with the additional benefit of making the band’s visual aesthetic seem so much more alive than if they faced crowd-ward all through the concert. As the set progresses, one is also stricken by the sheer amount of bangers that Aerosmith recorded during their career. The likes of “Love in an Elevator”, “Janie’s Got a Gun” (both off the aforementioned “Pump”) and “Dude (Looks Like a Lady)” (allegedly a quip about Mötley Crüe’s vocalist Vince Neil) need no elaboration of course, but it is the older, rarer and quirkier additions to the setlist that emerge as the standout moments for me. In the latter category is a pair of Fleetwood Mac covers (“Stop Messin’ Around” and “Oh Well”) brought to life through badass renditions that — does one dare? — even Steve Nicks & co. might have trouble matching; while also the blues-laced finale of the 1975-classic, “Sweet Emotion”, and the boogie-rocking “Rag Doll” off 1987’s “Permanent Vacation” etch lasting impressions on the psyche. Indeed, as Tyler sways his hips and waves his microphone stand on top of the customary grand piano during “Dream On” (which, ironically and facepalm-inducingly, some people still seem to think is a cover of Eminem’s “Sing for the Moment”) in the encore, it is hard to think of these proceedings as anything other than a triumphant farewell from America’s Greatest Rock & Roll Band — even if the occasionally crackling sound mix puts a slight dampener on them, at least when compared to Aerosmith’s glorious show at Hellfest 2014.